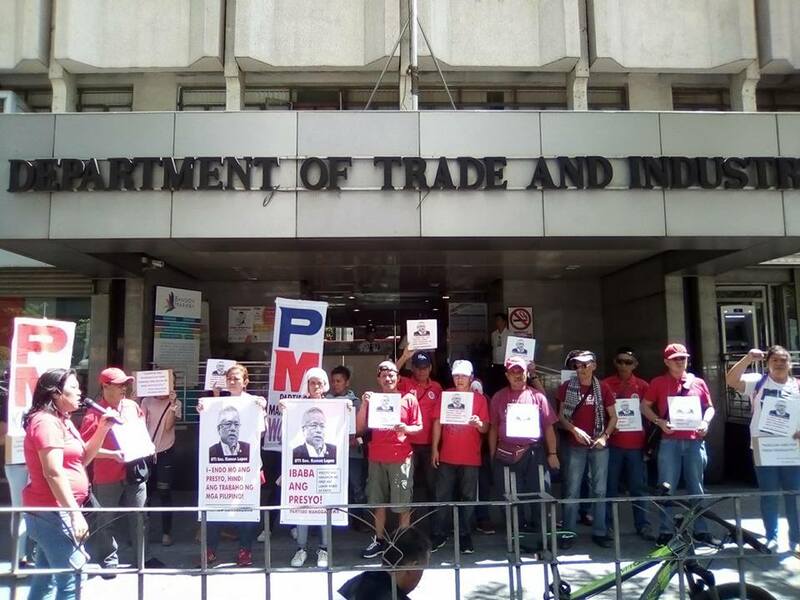 Women and youth members of the militant Partido Manggagawa (PM) trooped this morning to the offices of the Department of Trade and Industry (DTI) and the Employers Confederation of the Philippines (ECOP) to protest their pro-endo lobby. “Instead of taming inflation to protect consumers, DTI Sec. Ramon Lopez, has been promoting endo to advance the interests of capitalists,” stated Judy Ann Miranda, PM Secretary General. Some 100 PMK and women members of PM together with a contingent from the newly formed Kapatiran ng mga Unyon at Samahang Manggagawa joined the picket today against the DTI and ECOP for their “blackmail against regular jobs.” The rally comes after DTI and ECOP’s statements that ending endo will scare investors and the announcement of Malacanang that President Duterte is not signing an EO to make direct hiring the norm in employment. “DTI has been so busy conspiring with capitalists against the workers’ campaign versus endo while prices have steadily increased since the TRAIN law was implemented this year. The 3.6% average inflation for the first quarter of 2018 is the highest in four years. Further, monthly inflation has moved from 2.9% in December 2017 to 3.4% in January 2018 then onto 3.8% this February and 4.3% last March. Thus the trend is go beyond 4.3% as the months go by this year,” Miranda explained. Meanwhile the youth group Partido Manggagawa-Kabataan (PMK) expressed concern at the lack of jobs awaiting the hundreds of thousands of new graduates this year. “There are not enough jobs for the 600,000 college graduates and thousands more of K-12 graduates. Even worse, endo jobs not decent work awaits young workers entering the labor force,” asserted Kimberly Dolojo, a PUP student and a PMK spokesperson.